Chances are, your boss is probably not Academy Award-winning talent. Which means their acting skills in front of a camera might be…well, lacking, to say the least. 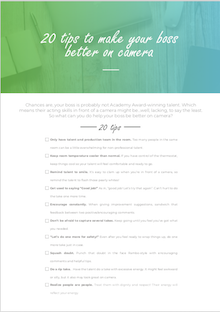 So what can you do help your boss be better on camera? Get these 20 powerful tips to increase their delivery! Enter your email below to download the PDF now! Also, you’ll get access to our Video Resource Center where we provide regular updates on new tech, tools, and tips to make better business videos. Look for a confirmation email with more details!